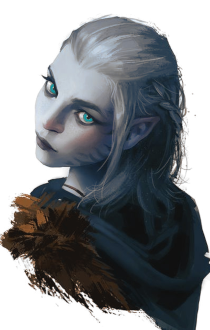 There's an awful lot of requests for watercolour versions of portraits in the portraits thread, and I figured that it wouldn't hurt to at least throw an alternative to asking other people out there, whether anyone uses it or not. The GIMP (https://www.gimp.org) I'm using version 2.8.14, so some things might look different, but hopefully not. 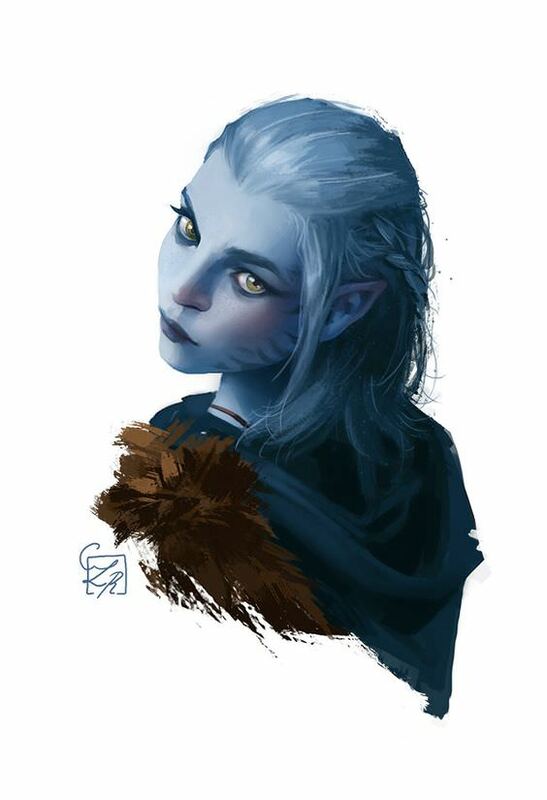 We're going to be portrait-ing the druid in blue, in this case. She's obviously a Pale Elf, it works. The first step, obviously, is to open up the image in the GIMP. If you're working with the original (recommended), crop it to a squareish area that contains definitely every part of the image you want to use. I think the best practise here is to zoom in a little bit more for the regular portrait, then out a bit for the watercolours, so the sides of the head are (ideally) not "hanging off" the sides of the watercolour. 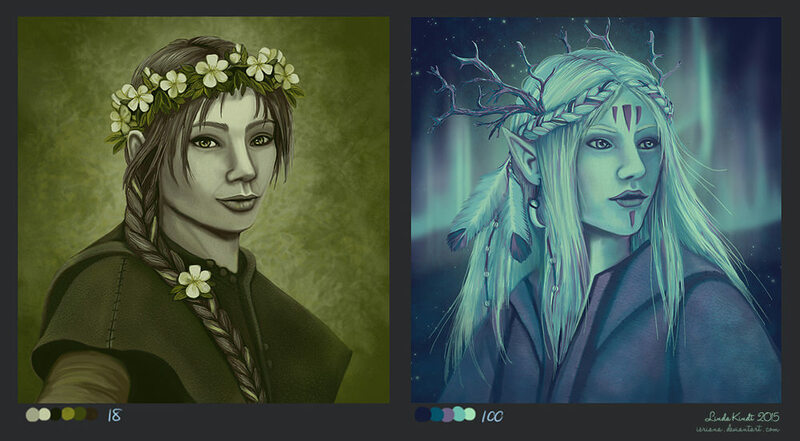 Secondly, if you need to, now's a good time to crop the image for your main portraits. Remember, the sizes are 210×330 for the _lg one, and 76×96 for the _sm one. Now revert to the original image. 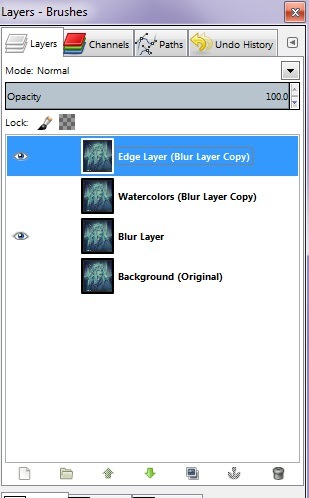 Create a duplicate layer (it's the image of the stacked photos on the layer dialogue, or right click and select it). This is what I call the "Blur Layer." 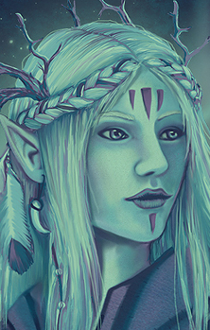 In short, we need to blur the original picture a bit; watercolours are not super great on fine details, and we can almost see Ms. Druid's pores here. Also, it helps for the next layer we're going to make. So, go to Filters->Blur->Selective Gaussian Blur and set the settings hereabouts. Specifically, you want a Blur Radius relative to the size of the image (something huge and detailed needs a higher blur radius, whereas you can probably drop it to 8 if the image is already portrait-sized). Also, set the Max Delta high, and slowly reduce it bit by bit until the facial details are good and visible. 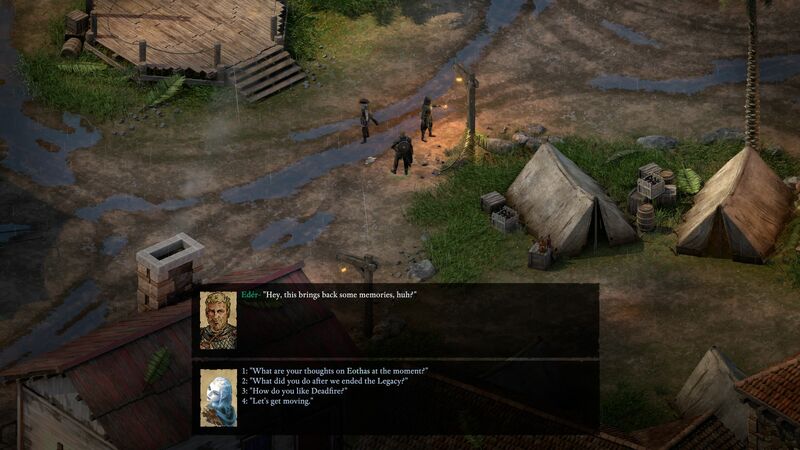 You don't want them to be sharp, but you should be able to make out the character's eyes in good detail. After setting that up, duplicate the Blur layer as before, twice. The top layer we'll call the Edge layer, for reasons that will become obvious. The middle layer we'll call the Watercolour layer, as that's the one that'll be doing all the "work" once we get to it. You can hide the Background layer, if you want to. We're done with it. First we'll work on the Edge layer, since it gives a good foundation for the next step. go to Filters->Edge-Detect->Edge and mess with the settings a bit. On my other pictures, the Robertson projection looked best. Here, I settled on the Laplace projection. In either case, you want the "Amount" to be about 4. The main thing you're looking for is maximum detail along the natural lines of the picture. 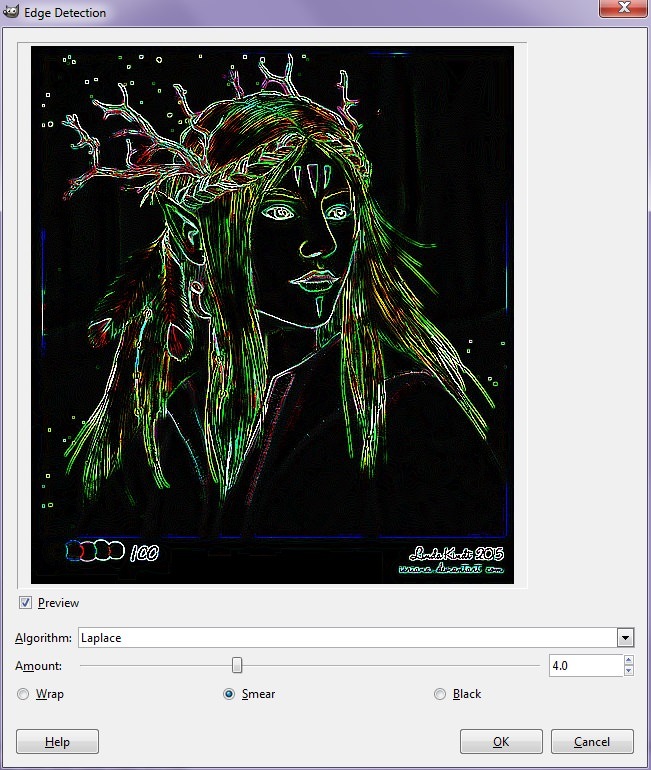 Once that's done, invert the picture (Colors->Invert) and set the layer blend mode (located near the top of the Layer window) to Multiply. Set the opacity to somewhere around 85%, whatever looks best. Your lines might also look overly... loud. Go to Colors->Hue-Saturation and adjust the Saturation of the Edge layer to ~-40, or whatever looks best. Okay, so what sorcery was that? Well, We used Edge to get nice, sharp lines, but it made the whole picture look like a still from Take On Me, if Take On Me was a psychedelic rock opera. We set the blend mode to Multiply, which multiplies the pixel values of the layer below by the pixel values of the layer you're on to determine what the result looks like. Because we inverted the image first, most of the pixels were just being multiplied by 100%. The ones that were not were the lines. Because the lines tend to come out as highly saturated colours, we reduced that to make them look more grey. So in the end we were multiplying the pixels we want to be the lines by almost-black (or close to 0% across the board), making all their numbers, well, almost-black. Oh, and messing with the opacity of the layer just makes the effect less extreme. It's... a bit of a mess to explain colours in mathematical terms. Hopefully it's still clear. Multiply by almost zero, get almost zero. Next up we're tackling the Watercolours layer. First, invert it like we did the Edge layer (Colors->Invert). Then, set the blend mode to Dodge. Next, set up your brush: Make sure you're on the Paintbrush tool, completely black colour (#000000), set the brush type to something non-circular (Acrylic 01 is the name of mine, and I'm pretty sure it comes standard with the GIMP) and the brush opacity to something very low, like 7%. Make sure the size is something comfortably high; we're going to be stroking it broadly across the picture, so you don't have to be shy here. Next up, start brushing and watch the magic happen. The colours should slowly begin to emerge as you brush. Essentially what you're doing here is brushing away the watercolours layer, allowing the Blur layer below to shine through. 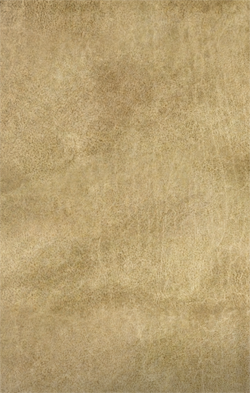 It gives you those nice, pale colours that resemble watercolours in a pattern that looks more or less brushed by hand. This is after a couple brushes. You kind of have to use your best judgment on when to stop, unfortunately. There's no way to automate this. When you're done brushing the Watercolours layer, you should ultimately end up with something that looks simpler and lighter than the original image. Then comes the rather hellish part. You need to cut the character out of the background. I probably should have mentioned that you can do this part at the start, and it often works more easily then. You have to leave in some background around the character to get the Edge filter to pick up the edges of the character properly, so you still have to partially cut them out of the background after, but it's possible to cut it close enough that you don't have to, yet still get the hard edges. Ultimately, it's largely up to the image itself whether it'll work. 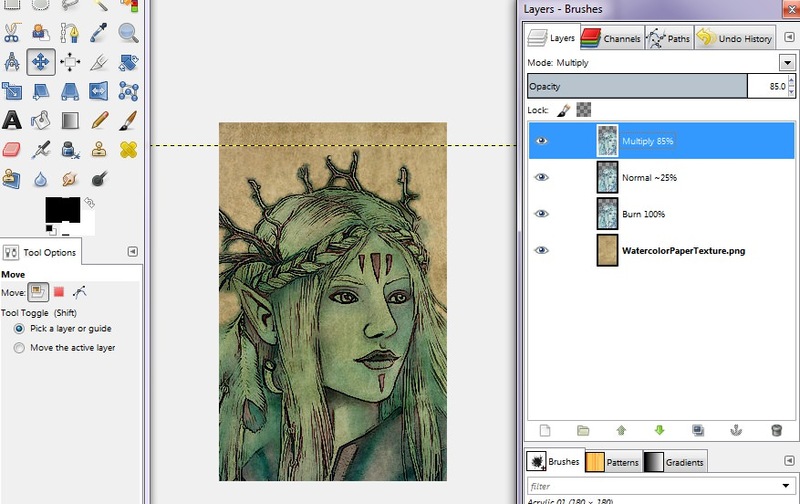 Anyway, right-click inside of the layer window and select "New from Visible," then hide all the other layers. Make sure the new layer has an alpha channel (right click it and see if "Add Alpha Channel" is greyed out), and if not add one. 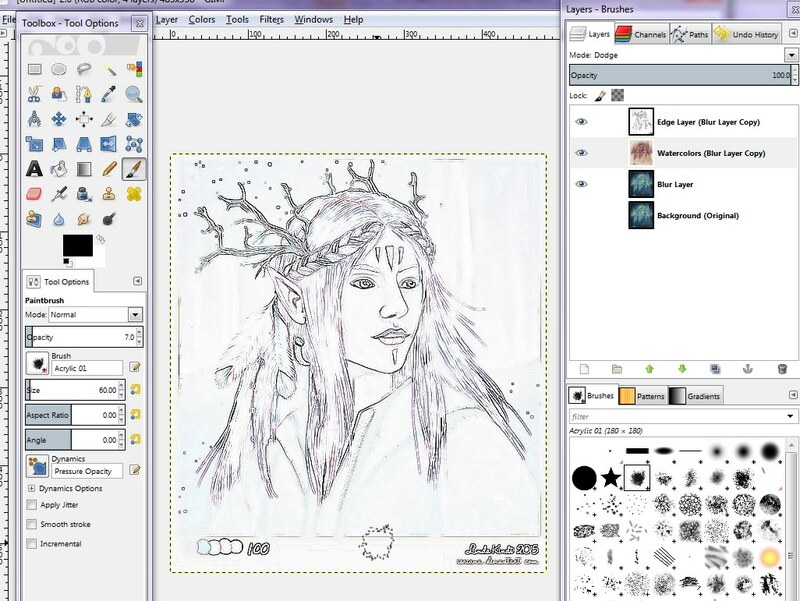 Switch to the Eraser tool, and decide whether you're going for the soft, round brush (called "2. Hardness 050" in the GIMP) or the same brush you used for the Watercolour layer. The soft brush is good for giving you a more gradual edge, which can look better on the finished product, but the acrylic brush gives a more naturalistic edge. Again, best judgment. Remove everything but the character themselves, and don't worry about the details on the outer edges of the image (remember, we're only using a small subset of the whole thing, in the end). You'll probably have to adjust your brush size (and opacity, perhaps) more than once before you're done. 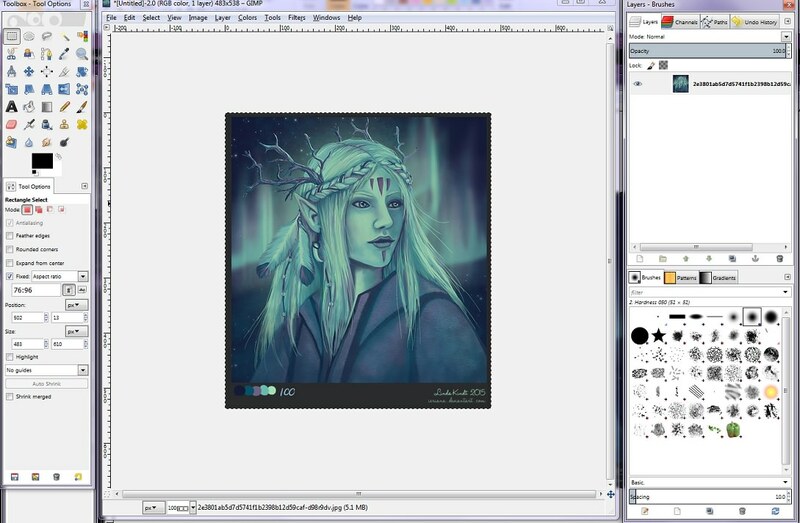 Once you're done, CTRL+C the image and open up your canvas background as a new image. 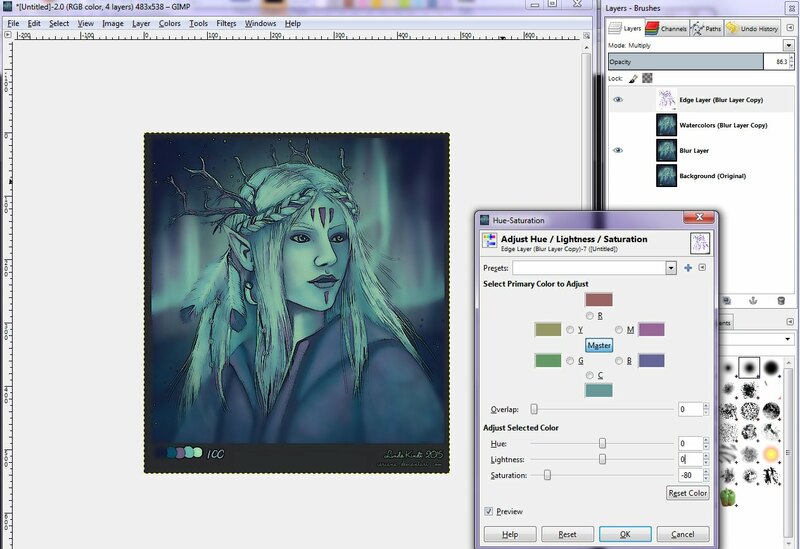 Paste the image on as a new layer (CTRL+V, then right click "Floating Selection (Pasted Layer)" in the layers background and pick "To New Layer"). Mess with it as needed. I don't really know how the actual images will translate into the game (since I'm not in the beta or anything) but I think you want them to basically fill the middle of the image. Here's where the next bit of Best Judgment™ comes into play. Sometimes the image looks fine when you paste it in. You can just call it a day there. In my case here, the lines were a little bit indistinct around the edges, and the colours are a little too bright (in the base image, too, I think) to really work as-is. Here's what I did: Make two copies of the layer. The middle copy is in Normal blend mode, but really low in opacity (like 25%, tops). The top layer is Multiply, because we need the picture to look nice and clear on the darker background. Set the opacity to something high, like 85%. The bottom layer is the foundation, set to Burn at 100% opacity. At this stage, basically anything goes. Mess with adding more layers, experiment with blend modes, hue/saturation, whatever. Once you're happy with it, resize the whole image (Image->Resize or else it just does the one layer) and set it to 90×141 for the _convo image, and then crop and resize to 76×96 for the _si image. Thankfully, you can avoid a lot of fine-tuning just off of how small the final pictures are. It's not as good as drawing them by hand, but doing this by hand is not even close to being an option for me, so finding a solution that requires as little of that as possible was a priority. If anything I did (or the reason for doing it) was unclear, please let me know in the topic and I can either answer there or amend the original post. Hopefully this gets more people doing their own watercolour portraits so there's plenty for the game's release on Tuesday! Thanks for making this tutorial. 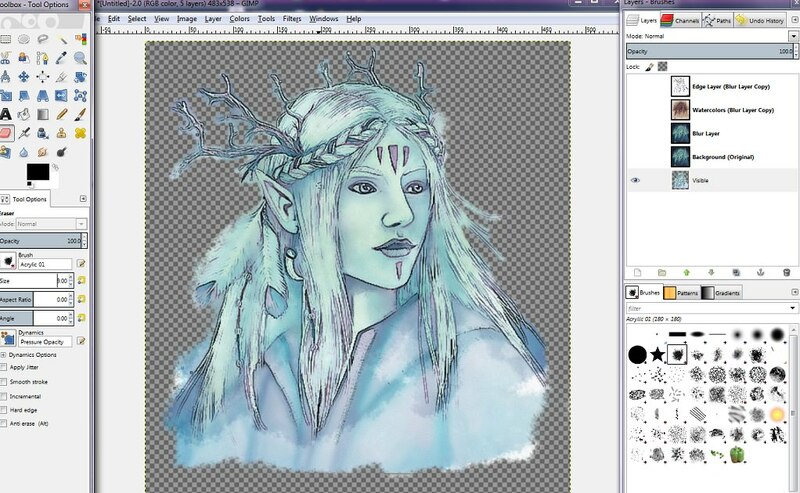 I have GIMP so I'll try to make a watercolor portrait on the weekend. This is a great tutorial. I have been doing it in a similar fashion but could still learn from this. Honestly, thank you so much for sharing this Orillion. as they say, if you want it done, do it yourself! 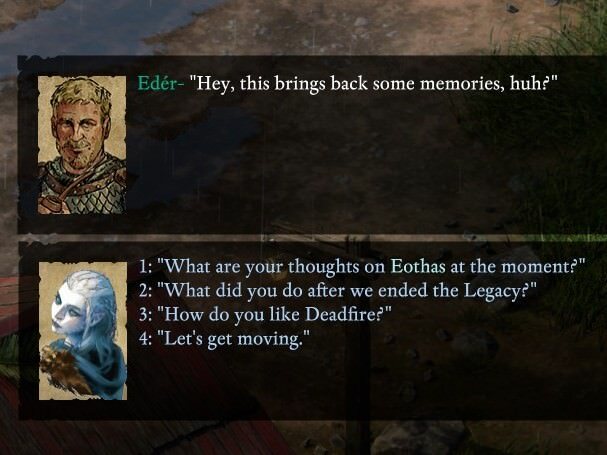 Can a mod make this a pinned thread? This is an important thread. Very nice. Thanks for taking the time to write this down. Nice guide, not how I do it in Gimp, but it will lead to okay results. Sorry for the double post, but I tried this method this morning and it works..... okay. Protip. 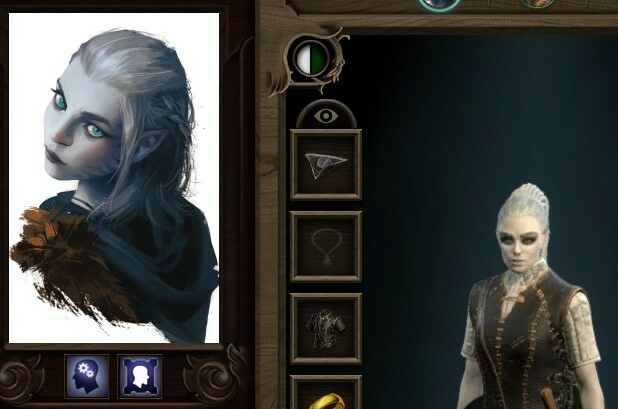 If you are working with an image that is already in a similar style to Deadfire portraits and not hard lines, like say you want to convert the original Calisca portrait, this guide is a bit rough. It wont put out a "bad" result, but it probably wont work super well with pictures that are darker/have a lot of color variance it just becomes sort of muddied. Works great for straight line drawings with hard edges though. Seemed to work okay for me. I would like to know how you do it Karkarov. Where is the tip on how to do it though? I don't have a step by step guide. 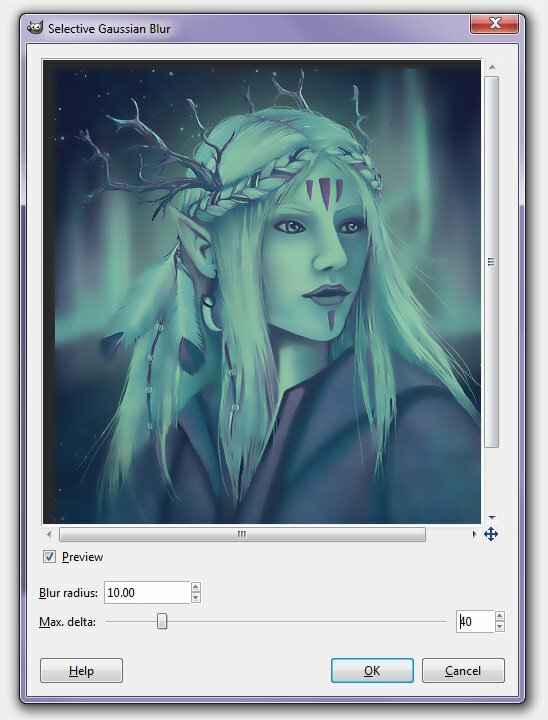 Every time I do it the only thing that is "consistent" is I will cut the portrait out of the background, and do some edge filter/inverting like in this tutorial, but I won't multiply the layer. I will turn white fully transparent and just use the lines as a semi transparent overlay. I also probably delete a lot of them. Beyond that? I hand draw a lot of lines to make certain details pop, I hand delete a lot of details that just become noise, I use 8-10 layers normally, I air brush in shading, increase saturation on one level, lower it on another, there is no "set pattern" to how I do it. I just compare to Obsidian made water color portraits, try to match it, test it in game, make changes based on what didn't look right, rinse wash repeat. Here is the final version of the water color portrait I made for myself, using my custom portrait I made using a Jason Seow portrait combined with the Heodan portrait. That probably took me around 8 hours. That said, it very closely matches the Obsidian portraits. Again, not bashing this tutorial at all. It will work well for line drawings like what he has in the example, in his terms pictures that are "actual art". It just doesn't produce "great" results for more complex images (like the Calisca portrait) without a large amount of extra work. Just bear in mind, my definition of "great" result is I could put in a line of official Obsidian watercolors, and a non fan would not be able to tell it did not belong. I'm not sure what you're seeing, but the only thing I called "actual art" was pictures that were not screenshots from another game. I'm doing this in Photoshop coz I seem to get better results, but I'm a complete noob - it comes out pretty much perfect at 221x330 - but if I make the image smaller for the convo size etc - then it's just a blur, you can distinguish anything - anything obvious I'm doing wrong here? Are you working on the 210x330 resolution image? The larger your base is the better when you downsize at the end. Great tutorial. I used GIMP quite a bit many years ago when I was making a Wolf3D mod. My problem currently is time. 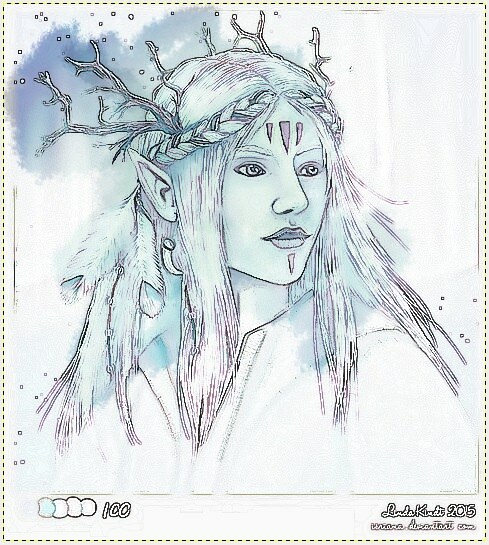 I seem to barely have time to play Deadfire now, let alone make a watercolor portrait. Still, I really appreciate this tutorial! Please note that it is the first time I use GIMP, so don't expect amazing quality. But it seems decent enough to use in game. And maybe it will be of use for someone. And here's the watercolour version. You can see the full picture here: It's actually a bit better with it. Thanks for this, it has been a great help for me and my sad attempts to create my own portraits. So in the beginning when you say to crop our portraits, you say revert back to the original image...so like, the uncropped? Then that one gets cropped to the _convo size? You revert to what you originally cropped it to. I prefer to work with square images that contain a little more than everything that'll actually appear in the finished portraits, just so I can afford to be a little sloppy around the edges. If you're working from something that's already a POE-sized portrait, then yeah, you want to revert to the uncropped image any time it comes up.